If you’re reading this magazine, you probably have at least have a vague idea of what composting is. The natural way to make nutritious (for plants, that is) fertilizer, composting was once a standard practice for every farmer, gardener and consumer. After the discovery in the 20th century that the presence of nitrogen, phosphorus and potassium (NPK are some of the most important minerals in soil that affect plant growth) in fertile soil, chemical fertilizers high in those elements became extremely popular—thanks in part to government and industry’s desire to find a use for excess nitrogen from the massive armament build-up for World War II. However, soil is much more than just the presence of three elements. There are many diverse living things, like worms and various bacteria, that perform important functions in soil to break down organic matter into parts that plants can use. The inner workings of soil are still not completely understood, but it is well known that really fertile soil is a complex living system of interdependent organisms. Although chemical fertilizers did spur huge gains in crop production, they also can wash into watersheds, causing damage to animals, plants and water supplies, and over time their continued use will kill organisms living in soil, leaving it infertile unless more fertilizer is applied. In addition, plants grown using chemical fertilizers have less nutritional value than those grown organically, and may have other negative effects on our environment and health. If you’re looking to grow your own food, you might find that the soil in your backyard or nearby plot of land is not quite up to producing what you want; perhaps you’re considering getting some fertilizer from the home and garden store to get the growing process started. With composting you can make some pretty great plant food yourself, and turn that ground into fertile soil over time. 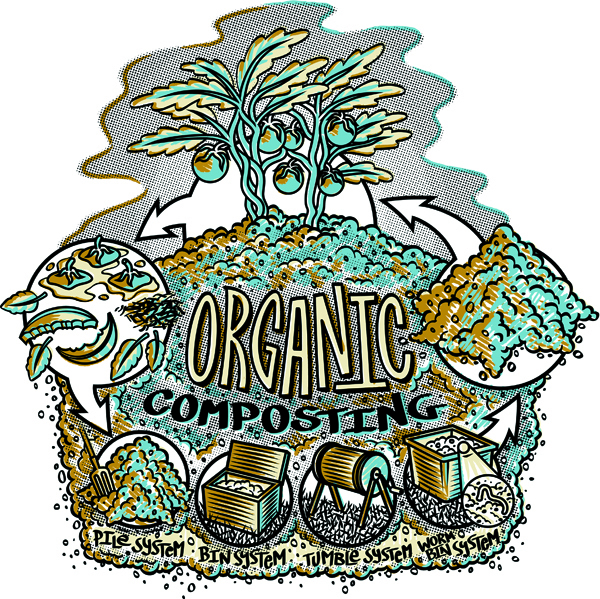 Composting is basically a way of controlling and speeding up the natural process of breaking down organic matter into nutrients that plants can use to grow. You can do it very simply, with a pile, or in a variety of complex methods. First, though, you need to know what to compost. Most guides break compostables down into two categories: “browns” and “greens.” Browns are older plant material, like dried leaves, old wood and straw. Greens are fresher plant material, like kitchen scraps, grass cuttings and leaves just off the tree. It’s best to mix in good amounts of each, as they both have benefits. Browns help provide aeration—composting bacteria need good ventilation—and greens have more moisture and nitrogen. You can compost most plant materials, like hay, fruit peels and veggie scraps; just make sure to mix them together. Hay or old leaves need to be mixed with fresher material, like kitchen scraps, to make sure air and water is mixed evenly. The bacteria that perform composting are aerobic, which means they need exposure to fresh air to survive. If there is not enough aeration, the aerobic bacteria will die and anaerobic bacteria will flourish. Anaerobic bacteria will still compost, but slower, and it will smell like rotting garbage. Bacteria also need moisture to keep going. Bulky, drier material like leaves can help provide aeration to compost (and it’s a good idea to turn your compost and mix it every so often), and fresher material provides moisture. The most important thing to know when composting is what not to add. You can add wood chips and sawdust providing they don’t come from chemically or pressure-treated wood, which could poison anything you use your compost to grow. Wood coated with polyurethane or paint are no good, and you can tell pressure-treated wood, which contains arsenic, by the greenish tint it usually has. Human and pet wastes are also unusable, as they often contain harmful pathogens. You should also avoid diseased plants or weeds if you’re planning on using the compost in your garden. Meat, bones and dairy products are also bad, as they will attract scavengers and pests, and take a very long time to break down. When compost is finished, it will look like good, dark soil or humus (not the food). It should smell moist and earthy. Once you’ve got compost, you can do a number of things with it. You can add it to the base of your plants, spread it on your garden patch like mulch or bury it with your bulbs. Happy composting!